Surprise! Everyone loves their iPhones. J.D. 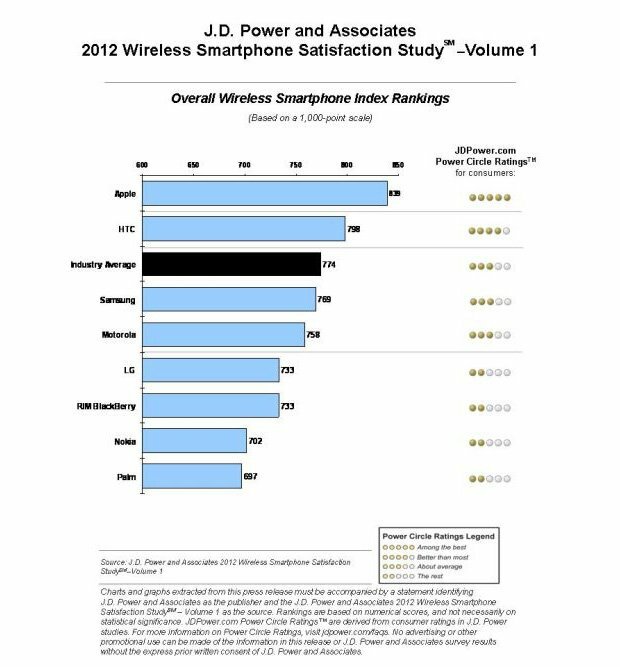 Power and Associates have just announced the results of their annual smartphone customer satisfaction survey, and like usual, Apple's iPhone has topped the list. On a 1,000-point scale, spanning criteria of performance, ease of operation, physical design, and features, Apple scored 839. Second place was claimed by HTC with a score of 798, while the industry average was 774. This is the seventh consecutive win for Apple in this particular survey. ChangeWave recently published a survey which backs up the sentiment, but I don't think we really need a lot of stats to prove the point that people love their iPhones. The J.D. Power and Associates survey does a good job highlighting what's important to people, though. Battery life is the least satisfying part of a smartphone, according to their research. Software stability is also really high on the list; devices which experienced a crash at least once a week averaged a score of 691. On that note, what's the very worst thing you could say about your iPhone? The screen size?